Detailed guide with helpful information on Nebraska fees, costs, requirements, licenses, formation, and hiring. Also includes tips, FAQs, and a checklist. With a low cost of living and a growing professional workforce, Nebraska offers future entrepreneurs a great location to open their new business. In 2018, nearly 170,000 local businesses were classified as small business, making up 96.5% of Nebraska’s business community. 1. Choose a business structure. There are four popular business structures to choose from. A sole proprietorship is a business that is owned and managed by one individual, with no legal difference between the owner and business. A partnership is a legal agreement between two or more individuals. Depending on the partnership, the owners may share management responsibilities and profits. 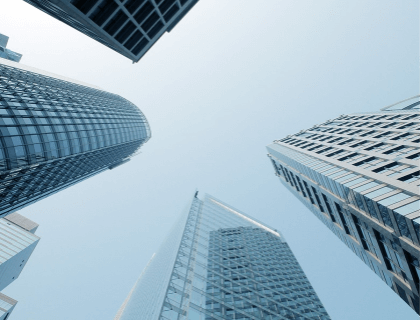 A Limited Liability Company is a legal structure whereby the owner/s of a company are not personally liable for the business debts or liabilities. A corporation is seen as a separate entity from its owners and treated so by law. The business is led by a group of officers known as the board of directors. There are different versions of some business structures, such as limited partnerships and S corporations. Your business structure should provide you with the best tax, liability, and financial benefit. File the Certificate of Organization. 2. Register a business name. By law, your business name must be registered with the Nebraska Secretary of State (SOS). First, you need to verify that your business name is available. To check if your business name is already taken, you can do a business entity search on the SOS website. If your business name is available, you can then file an Application for Reservation of Name with the Nebraska SOS. The name reservation will be available for 120 days. Depending on your business structure, there is a filing fee included. If your business has employees, you must obtain a federal Employer Identification Number (EIN) from the IRS. Your EIN is also needed if your business is taxed separately from you. To ensure your business finances remain organized and accurate, consider opening a separate business bank account. Contact your local banks and research the different business accounts available. 5. Register with the Nebraska Department of Revenue. In order to sell products in the state of Nebraska, you must register for a sales tax permit with the Department of Revenue (DOR). Also referred to as a reseller’s license, a vendor's license or a resale certificate. In addition, if you plan on hiring employees, you must register with the DOR for employer withholding tax. To apply for both registrations, you can use Form 20, Nebraska Tax Application. Once you've hired your new employees, you need to report them to the Nebraska State Directory of New Hires. Federal and State law requires all employers to report newly hired and re-hired employees within 20 days of employment. This process should be repeated every time you hire a new employee, as well as when you re-hire an employee who hasn't worked at your business in 60 consecutive days. For quick and easy reporting, use the online method. You can also download, print, and fax or mail the New Hire Reporting Form. Mailing information is available on the form. To legally operate your business in Nebraska, you may need to acquire additional regulatory licenses and permits. These various licenses cover areas such as health and safety, the environment, and expert services or professions. For example, if you want to open a coffee shop, you will need a food service license. To search through the different licenses and permits issued by the state, check the nebraska.gov website. For an efficient search, look for any cities or counties where you will do business. For businesses operating in special professions, you can get the basic licensing information by visiting the Professions & Occupations section of the Nebraska Department of Health and Human Services (DHHS) website. For professions such as medicine, law, engineering or finance, you’ll need to check the state regulatory board for your profession, e.g. the Nebraska Board of Engineers and Architects. A business owner that hires one or more employees, full or part-time, is required to carry workers' compensation insurance. However, there may be some exemptions. Contact the State of Nebraska Workers' Compensation Court for more information about exemptions and compliance. In Nebraska, it's also mandatory to have minimum automobile insurance for all your business drivers. Over time, state and federal laws affecting your business or industry may change. Therefore, it's important that you stay up to date with the latest laws and regulations. LLCs in Nebraska must file a biennial report with the Nebraska SOS every odd-numbered year. You can file the report online or by mail. To access the online filing, you'll need your LLC's state-issued SOS Account Number. There is a $10.00 filing fee, plus an additional $3.00 for online reports. A corporation must also file a biennial report with the Nebraska SOS every even-numbered year. The corporation reporting requirement includes paying a corporate occupation tax. How much does it cost to register a business name in Nebraska? It costs $15.00 - $30.00 to register a business with the Nebraska Secretary of State. Where can I apply for a Nebraska sales tax license? You can apply for a sales tax license online at the Department of Revenue website. Are there any specific rules for an LLC in Nebraska? Name of your Registered Agent. Yes. Nebraska law requires all employers of one or more employees, whether full-time or casual, to carry workers' compensation. 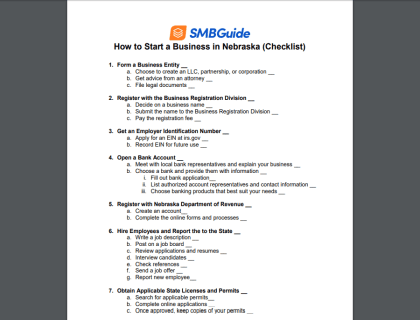 How do I register a business name in Nebraska? You can register your business name with the Nebraska Secretary of State. You can visit the SOS website for the appropriate documentation. $100.00 + $5.00 per page.